For better or worse, Mapnik has long had a reputation for being difficult to install. Ditto OSM planet dumps. I know and you know this is not true, but just because Dane has done so much work to drastically simplify the process doesn't mean you want to do it yourself, like how people stopped soldering their own MP3 players when the iPod came out. Meanwhile, Amazon has a thing called EC2, the Elastic Compute Cloud, and it's amazing, really one of the biggest changes to my work as a technology/research/CTO guy. One of the things you can do with an elastic compute cloud is to create templates for new machines, and let other people run them. So you put these things together, and you get the Tile Drawer. a Cascadenik stylesheet for how it should look. Your new instance will boot itself up, and immediately start pulling down OpenStreetMap data to render map tiles with. This is pretty much the whole story. I have a couple example stylesheets up for your use, and I'm very interested in adding more. 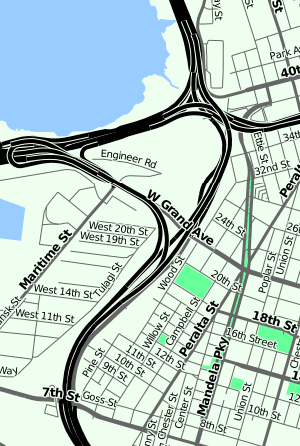 I'm excited by the idea of a community-maintained collection of cartographic styles, all of which can be immediately applied to any geographic location covered by OpenStreetMap. I'm also excited by the idea that designers can create and rapidly use new kinds of map renderings - we've been plumbing the depths of customized Mapnik renderings for a few years, and it's time to see it break out into wider use. We're already seeing beautiful new map designs like Craig Mod's Art Space Tokyo book, Wilson Miner's EveryBlock maps, and Matt Jones's Lynchian_Mid Cloudmade style for Dopplr. There should be more. The availability of the OpenStreetMap data set itself is a whopping great slab of social surplus. What did people do when you still needed to get someone from NavTeq or TeleAtlas on the phone for an indeterminate amount of money when you wanted some map data? I was hearing from new Google friends at the Camp Roberts thing a few weeks back that even they reach for OSM when they need to experiment. It's so simple, the whole thing is available, all the time, with regular updates. I'm hoping to see it continue to gradually replace other source of map data for normal, day-to-day city navigation use. There are a few things that Tile Drawer does not do yet, because it's new. For example, it does not keep up to date with OSM updates. Since it's so cheap and easy to fire up additional instances, I'm imagining that this need can be addressed for the moment by periodically creating replacement Tile Drawers and killing old ones. It doesn't serve anything other than OpenStreetMap data. It doesn't do WMS. It doesn't render multiple styles at once. None of these things seem important yet, which doesn't mean they won't happen at some point in the future. But first go check out Tile Drawer.